Israel has always had a weakness with PR; it is one of the perpetual down-sides of a nation having more serious issues to think about whilst also being faced with an enemy with a far larger population. Even back when the existential threat was on every border, Israel wasn’t always an easy sell, and there is no point pretending that Western Nations have only just started turning; Israel has known international dissatisfaction since the day it was born and has experienced far weaker days on the international stage than it is having today. Back in the 1970’s & 1980’s, the Arab boycott was in full swing and US companies such as Pepsi and McDonald’s could not be found in Israel; during the mandate, local Arabs boycotted Jewish business; today, some Arab states still reject any passport with an Israeli stamp and whilst UN hostility has mainly arisen from the Arab bloc or Warsaw Pact, if it wasn’t for the threat of the US veto, the UN, with the support of many European democracies, would have long ago voted Israel as the primary cause of world hunger and disease. BDS is not new. So the first step is to recognise that BDS is the same threat; one that given its ultimate wish, would want to see Israel removed from the map. But it is also important not to be blind-sided by this similarity, because the environment in which this boycott operates has changed, which in turn has allowed for the Arab boycott of Israel to evolve into something more refined. Only through grasping both the similarity (the aim) and the difference (the environment) does it become possible to gauge what BDS is. 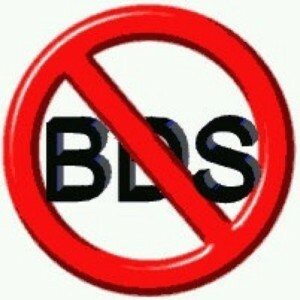 Regardless of what it claims, BDS is a one-state movement. It wants to create both a Palestinian state in the West Bank and another Palestinian state in Israel and then unite them. It is the bullet that has forced the collapse of many a peace deal. How does the Palestinian leadership explain to the refugees in Lebanon, Jordan & Syria that they have been used? Millions of people, deliberately left to rot in refugee camps and intentionally sold out for over 60 years; generations of people impoverished, when tragically it was always possible to resettle them, allowing them to create new lives as refugees have done throughout history. When any Palestinian leader is negotiating, however much is on the table, it is this self-created horror above everything else that drags any possibility for settlement into the quagmire. The problem between Israel and the Palestinians can be solved only if the Palestinians and Arab nations can answer that question. BDS is yet another movement that seeks to avoid it by using a decontextualized 66 year old resolution as one of its principal aims. The right of return; the idea that somehow, Israel should pay the ultimate price for all of the bad decisions the Arabs have made for the last 100 years; a theoretical resetting of a clock that cannot be reset. In other words, and without argument, if Israel was not in control of the West Bank or Gaza, if there was already an independent Palestinian state, if there was no occupation of post 1967 lands and Israel dismantled *all* the settlements, if Shimon Peres was Prime Minister with Yossi Beilin and Shelly Yachimovich by his side, then BDS would still exist with its primary aim intact and unfulfilled. There is therefore no difference between the aims of the 2005-15 BDS campaign and the 1949-1967 Arab actions against Israel or the pre-1948 Arab rejection of a Jewish presence in the region; they all operate beyond the two state solution and with a single goal in mind. This is a fight over Israel; not the West Bank, not Gaza and not the Palestinians. BDS is just the same story redressed as something it is not. It is a destructive movement, focusing on Islamic Justice and intent on removing Israel from the map. Students who align with this movement should understand exactly what they align themselves with. It is when we analyze the environment that we can see why BDS has created a different impact to the ones we usually associate with the Arab intention of destructing Israel. Most importantly, it relies on the politician’s syllogism: ‘we must do something, this is something, therefore, we must do this’. There is real frustration at a situation that simply does not seem to have a solution; I am frustrated myself. The peace process does not exist and whilst the blame may lie mainly with Palestinian intransigence, there is no viable alternative option to be presented. To someone without a depth of knowledge of the conflict, who wants to register his dissatisfaction with the situation, is tired of horrific images and does not want to hear there is no solution, BDS, however flawed, is the only movement in town. It doesn’t have to be reasonable, rational or even sane; BDS works because it is the only name on the ballot box. Human Rights: In the West ‘Human Rights’ has become an overused keyword that despite hypocrisy and inconsistency is an easy sell to young, impressionable and idealistic students. The Palestinian call for BDS has removed the conflict from the equation and it has been dressed up purely as a ‘human rights’ exercise. Piggybacking on the EHCR and UDHR, the BDS founders know that by asking for ‘justice’ rather than ‘peace’ they can call for the destruction of a liberal democracy without creating a ripple in the lake. 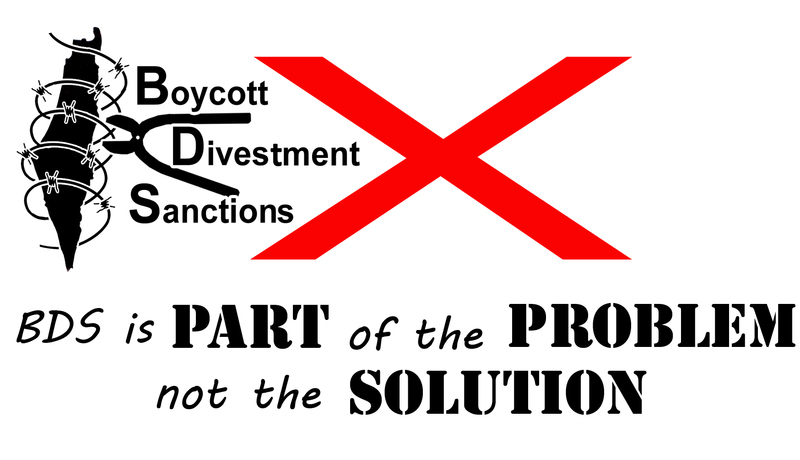 BDS cannot be aligned with peace – it defeats their primary purpose. Anti-Semitism: No, not every one involved with BDS is an anti-Semite, but by the same token it is difficult to imagine an anti-Semite not aligning with the movement. Further, BDS plays on age old anti-Semitic stereo-types and imagery; creating a demonic version of Israel, one based on fears of Jewish power, Jewish cruelty and Jewish inhumanity and whether intentionally or unintentionally, people who identify with this ancient hatred, even subconsciously, find themselves ready and willing soldiers for the BDS cause. Immigration: There is no hiding from the fact that the demographic in Europe and the US is changing. An influx of people from nations and cultures far more sympathetic to the Palestinian cause has created a hostile environment in some campuses. Therefore alongside immigrant students, 2nd & 3rd generation immigrant activists can present BDS as a home grown protest movement in sympathy with the Palestinian cause rather than what it is, an imported Palestinian weapon of war. Numerical inferiority: Mainly because of the impact of the changing demographic, people actively opposing BDS are now heavily outnumbered by rabid BDS activists, willing to lie and spill their anti-Semitic venom on any ear within reach. The vast majority of students may be people sympathetic to Israel and culturally aligned with its western values, but these ‘BDS targets’ are far more likely to hear how wonderful and important BDS is, than what its real aims are. Blurred lines: This is one of BDS greatest strengths. Israelis themselves are split, some Israelis support heavy settlement activity, some wish for an partial or total withdrawal to near/1967 lines . However, international bodies almost universally recognize Israel’s presence beyond the green line (1967) as an occupation despite this arguably being no more than a cease fire line from 1949 (based ironically on Arab insistence this was not to be considered a permanent border). This does however create a difference between activity beyond the green line and opposition to activity within pre-1967 Israel and BDS blurs these lines to its own advantage. Anyone, who in any way, supports the idea that Israel should be more accommodating in its dealing with the Palestinians is brought under the umbrella of an organization that calls for Israel’s complete destruction. As BDS hides its intent behind HR keywords and talk of justice, many of those standing behind a movement that wants to wipe Israel from the map, think they are only opposing settlements or supporting a two-state solution. Israel’s strength : For a few decades now, Israel has been a super-power in the region. Long gone are the days when young people left Europe to enjoy the Kibbutz and far-fetched is the idea Israel is in imminent danger of being annihilated by Arab nations that are disintegrating before our eyes. Israel is entirely capable of handling itself and regional war has been replaced by a war (or wars) of attrition; terrorist groups (of which BDS is part), using violent and non violent means to attack Israel’s foundations. But whereas Israel’s David was defending against the Arab Goliath, most people no longer view the conflict in this way. Israel is now considered the Goliath, the Palestinians, the underdog. It is best neither to underestimate nor overestimate BDS. It is another weapon in the hands of those that seek to undermine Israel and has fertile ground to explore amongst students, especially given the rise in the number of home grown and immigrant students from areas or cultures traditionally more hostile towards Jews or Israel. Having said that there is probably a ceiling to BDS, and Israel is a Western democratic nation, fully integrated in a global economy, and the alienation of, for example Israeli academics, is anathema to some of the very core targets of BDS (hence the recent clarification from the British universities following the disgraceful NUS vote). As with the Royal Institute of British Architects, BDS self-declared victories are often followed by defeats. The idea that large companies involved in any industry dependent on academia or technology or research would currently divest from a superpower of innovation is as absurd as the notion that Israel, as the only free nation with Western values in the entire region, should be treated as a pariah. This doesn’t mean that the BDS ceiling cannot hurt Israel, nor that it should be taken lightly, far from it, it simply suggests that as long as BDS is confronted effectively, the spread of the disease can be stopped. But the decision makers of today were the Kibbutz Volunteers of yesteryear and the decision makers of tomorrow are currently being fed BDS propaganda; for this reason it is important not to underestimate the long term effects of only fighting the battle at the business or political level whilst allowing the movement a free reign on the campus. There should be no room for the anti-Semitic lie that Israel is a pariah state to evolve and spread upon campus. The response to BDS has to be multi-faceted, and each battle is different; you do not turn up for a navy battle with tanks. On campus, in a left wing, secular environment, Israel’s case has to be heard and there is an important need to place an alternative on the agenda. BDS must not be the only game in town. Make no mistake, this is a war; the same war, the one Zionists have been fighting ever since the movement began. The war for Israel’s right to live in peace. ‘ Israel has known international dissatisfaction since the day it was born and has experienced far weaker days on the international stage than it is having today’. When were you born? The sort of discrimination that Israel is experiencing now cannot be overcome by the Jews doing their own thing and turning boycotts to their own advantage. That is what happened in the early years of the state, when Sonol, Delek and Amisragaz replaced the major oil companies who would not do business with Israel and we drank Tempo and gazoz instead of Coke and Pepsi. The Arabs have discovered that throwing money at anti-Israel propaganda is far more effective and economical than doing anything to alleviate the plight of the Palestinians, especially those in refugee camps in their own territory who face the most evil discrimination. There are seventy professions, including doctors, that are barred to Palestinian refugees in Lebanon! The Palestinians who run everything in Kuwait are despised, I know this from a close friend who lived in Kuwait for a while. The only place where Palestinians do not face discrimination is Israel! Even in Gaza and the West Bank if they belong to the ‘wrong’ political party or the wrong religion (Christianity) they are denied privileges, that is what it is like when you live under a dictatorship. I am not sure what you disagree with Josephine. Israel’s position vis-a-vis the international community has always been difficult. Each of the wars it fought, would have been absolute victories had it not been for international pressure. The only reason Israel has a Palestinian problem is because even as early as 1949 Israel’s position was weakened by UN resolutions. Sure there was sentiment in the west, but politically – Israel has been far more estranged before than it is today. But I am not saying Israel is not experiencing it today, merely pointing out BDS is not new…..
every time the bds open their mouths, their mouth becomes bigger. in order to fit in their foot. i hope they choke on it. about the boycott justification: Of course Israel faced a lot of boycott from the beginning. How would you feel if suddenly all refugees from Europe would take most of the land from Israel to claim it as their own restricting your position, and way of living, tearing down your houses even beyond the 22% of what used to be theirs that according to international law is Palestine. About the refugee comment: the reason they are living abroad in misery is because Israel is not giving them the right of return, if you done any research about BDS you would know its one of the things they are fighting for. the article doesn’t misinform – you distort and misrepresent. 1. Refugees arrived, bought homes and set up lives. That’s what they did. Your whole ‘took land’ thing is classic right wing racist anti-refugee claptrap. Everything that followed was a result of anti-Jewish violence in response to Jewish refugees arriving. Just as we would view anti-refugee violence as far-right today, so we should look on the Arab violence against Jewish refugees. 2. I don’t know if you truly believe the nonsense you write or simply haven’t thought it through. You are saying that if the UK mistreats refugees it is because of the land they came from. It is utter hogwash to blame the ‘misery’ of refugees in Lebanon on Israel. If refugees are being mistreated in Lebanon it is Lebanon’s fault.